During the past days, I re-organized the archive of my films, going through the raw material of my very first projects I did as a teenager. To me, it was fascinating and brought back a lot of memories of a time when a few friends and I just did every goofy thing on our mind to make weird little comedy films. Back then, we just wanted to do fun films and did not care how “professional” they looked. The “sets” certainly were not professional by any standard. A guy with a camera (not even an external microphone), a few actors making up lines on the spot based on a short script while I directed the scenes… Yet, I probably learned all basics about filmmaking during that time of unlimited experimentation. We did not think of us as “filmmakers” (meaning we didn’t really think of us and our image); we simply were some friends who wanted to create films and enjoyed making them; we just wanted to create the result and didn’t particularly care about the means to get there, how “professional” or “standardized” they were. A time of experimenting and learning. Klaus Müller and I in Killer-Squirrels (Summer 2008). There is an issue I observe with some young filmmakers I meet at film festivals, which I want to address. While this has the potential to sound a bit “preachy”, please keep in mind that these observations are the ones that worked for me, and others might find different approaches better. The old saying: There are no hard rules in arts. That being said, in my opinion, some aspiring filmmakers seem to be thinking too much about the “process” of filmmaking. In turn, their first projects can become overwhelming as they have no practice: “I want to do a film. OK. I need a script. I need a camera. I need a crew.” Here it should end in the beginning, that’s all you need along an editing station. But the thoughts often continue: “On a filmset, I need catering. I need sophisticated lighting. I need a clapperboard. External sound. Assistants…” More and more things that can become overwhelming for an unexperienced filmmaker. And during all those thoughts, the pure joy of filmmaking often gets buried. I’ve seen quite a few aspiring filmmakers who got so frustrated by difficulties in their first projects that they stopped filmmaking after one or two short films. A little zombie-film I did in 2008. “a real life!! 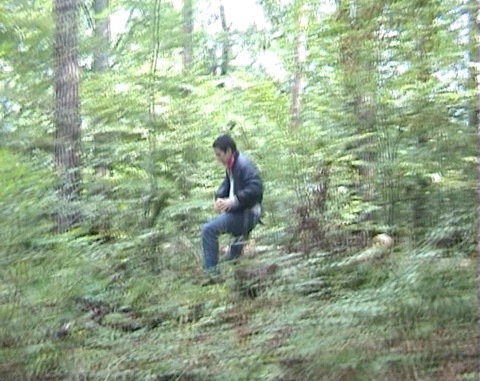 !” (2006) – A still from my very first film. I produced/directed my first short film a real life!!! in 2006, when I was 17 (the only crew beside me being my father who did the cinematography), and did Killer-Squirrels, the last film of my earliest phase (that you can watch here), in 2008. In those two years, I produced numerous films with lengths between 14 and 58 minutes with casts of up to 12 people. The cast were friends, multiple roles were often played by the same actors, props and locations were simple and scenarios were generally very absurdist-funny. My first film, though, was a straight no-budget drama that failed on quite a few levels: Without budget, any fault in acting, cinematography etc., took away from the illusion that we witness a serious, “real” event happening. The end result was nothing like I imagined, and I think I’ve never shown the whole thing to anybody. But that was actually good, as that film taught me a lot of lessons. On editing, on planning. On what works and what doesn’t without a budget. And looking at the end result I learned that at that time – at least without a budget – I much preferred doing comedy films to drama. All that while I hadn’t spent too much energy organizing a “proper” film set for that film. It was a small project that left me eager to try new things rather than being frustrated, and all subsequent films were much more fun. Over the following two years, my films became larger and larger, finally culminating in my two highlights of those years: B. vs. A. in 2007, and Killer-Squirrels in 2008. With all those films, I learned a lot about directing actors and organizing productions. In B. vs. A., for example, we did the cinematography purely by instinct without much thought; in Killer-Squirrels I already planned it more thoroughly, and the editing of that film finally became as sophisticated as I had planned it in my head. A scene from “Menschenliebe” – filmed less than a year after “Killer-Squirrels” with the same budget. At the end of that phase, I finally thought: “Hey, I want to do a bigger film. I can organize small crews – let’s try to make it bigger, get more actors. Let’s try to get more sets. And let’s get a decent camera and put more focus on cinematography, get a tripod, get a dolly, so the film finally looks exactly as I want…” Killer-Squirrels finished post production in October 2008. And in April 2009, Menschenliebe had its first day of filming. I could have never done Menschenliebe without the practice from my earlier goofy small projects. Due to all the experience with the small films, it was just a step up to go on bigger, more professional sets; just a small step, not a huge – potentially intimidating – leap from zero to professional production. Thus, increasing the standard with Menschenliebe felt like a very natural step. It was not stressful, but an enjoyable challenge. Getting a routine is important, and then increasing the standards with every new project until you can finally recreate what you see in your mind on screen. Those few formative years until 2009 were a lot of fun – and the resulting, goofy films are still enjoyable as the passion and excitement we put into them shines through. For me, that’s only possible because the process, the “proper” way a film “should” be made was never in the foreground – we were always more excited about the result, the “goal”, the final film, no matter how little budget and means there were. The skills? Were acquired as a side effect to get better results on screen, as I wanted to make each project look better than the one before. As long as you up your standards in every subsequent production, that’s a method that I feel is best for learning your basics as an artist, small, fun, casual but steady steps until you reach a level you feel comfortable at. This entry was posted in Film, Observations and tagged Filmmaking, Killer-Squirrels, Learning, Menschenliebe on October 7, 2016 by Alexander_Tuschinski.